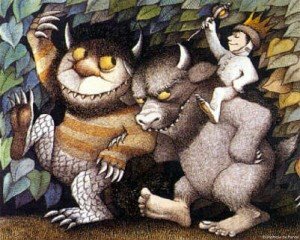 Where the Wild Things Are is a children’s classic, and it should make an excellent film: Original author Maurice Sendak is directly involved, the screenplay is written by Dave Eggers (who always does his best to make lit fun), and for crying out loud, it’s 15 years in the making. Plus, Catherine Keener will be there. Keener only makes good movies, she just does. And if the trailer is any indication – which, I know, I know, it often isn’t – Where the Wild Things Are will be gratifying for both young and grown-up, wild and calm, fantastic and everyday. Because Wild Things shouldn’t be considered just another children’s fantasy translated to film with hopes of Potter-like success — a success that has generated such tragic tarnishes upon epic children’s tales as Chronicles of Narnia: Prince Caspian and The Golden Compass. First of all, the book’s mere ten lines allow Eggers and director Spike Jonze an abundance of artistic freedom. In addition, while it’s true at this point that Daniel Radcliffe, Emma Watson, and Rupert Grint could sit onscreen wearing pointy hats and tossing a lazy golden snitch back and forth for three hours and the Harry Potter franchise would still make money, interest in Wild Things began before the first J.K. Rowling triumph was even published (and thus long before the first multi-billion dollar cinematic success formed the frantic children’s-books-into-film snowball). And most importantly, the widespread appreciation of Maurice Sendak’s award-winning picture book, although once viewed as somewhat scandalous, delves deeper than any of those other children’s stories. And the sentiment, more pure. Indeed, Sendak’s book is a fundamental representation of what it is to be repressed, and to subsequently break free by way of intellect, imagination, and determination. As always, when comfort and routine once again is desired, you can return safely home. Even if home is what caused you to rebel in the first place. Max is an everychild; by default, each of us as grown people simultaneously relate, remember, and reminisce. And Wild Things is ultimately propelled by passion: passionate anger, passionate longing, passionate love — Max does, after all, get his supper in the end — and so are the rest of us no matter what age. Or at least we should be. Let the wild rumpus begin.